On Sunday, I had the good fortune of attending the Cooking With Passion, Powered By Chefs an Asian culinary competition held at the Moscone Center in San Francisco. 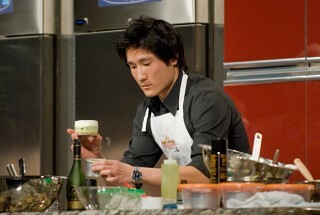 At this event, 12 contestants were paired with 12 chefs for prizes in three categories: Asian Fusion, Non-Asian, and Dessert. To decide on the winners of the event, a panel of four judges was enlisted: Roland Passot, the execute chef and owner of La Folie Restaurant in San Francisco, Joanne Weir, the author of several excellent cookbooks and host of several PBS cooking shows, Ronald Mar, the food and wine critic of Asian Gourmet Magazine, and Murat Eskicioglu, the general manager of Catering by SMG for the Moscone Center. Over a month ago, potential contestants sent in recipes that they planned on preparing for the competition. 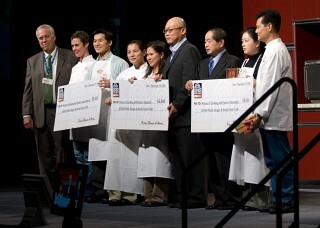 Then twelve were selected by each of the featured chefs participating in the competition. 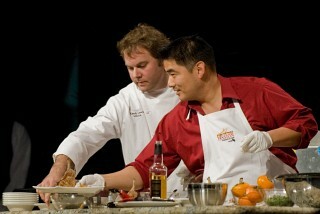 Prior to the competition, each chef had time to work with their contestant to perfect the recipes. Contestant #2: Phu Tai Phan, a product manager for American Chariot Company, prepared South East Asian Surf & Turf (a combination of grilled sirloin wrapped in rice noodle and papaya with caramelized prawns) with Robert Lam, the executive chef and owner of Butterfly Restaurant. 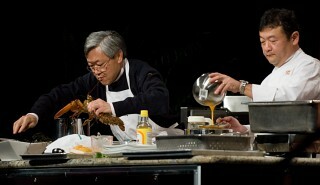 Contestant #3: George Chow, a semi-retired stock trader, prepared Lobster & Sea Urchin Egg Custard with Ken Tominaga, the executive chef and owner of Hana Japanese Restaurant. Contestant #4: Dolby Wong, a printing supply and equipment consultant, prepared Moonlit Gondola (a three dimensional arrangement of a forest of broccolini and endive boats floating on a lake of shark fin soup) with Lee Kwong Chung, the executive chef of Joy Luck Place Restaurant. Contestant #5: Jie Hao, a homemaker, prepared Red & White Roses (strips of halibut rolled up and steamed to form white roses paired with a tomato peel rolled up into a rose) with So Ting Chiu, the executive chef of Hong Kong Flower Lounge. The original recipe that Jie Hao used was from this website, which is completely in Chinese. Contestant #6: Matia Lau, a quality assurance assistant manager, prepared Tropical Seafood Papaya Boat (a seafood dish served in a papaya set on a plate decorated with a cucumber palm tree, clouds, and hills) with Ronald Lee, the executive chef of Hong Kong East Ocean Restaurant. The rules of the competition seemed a bit loose in what could be prepared beforehand. It seemed like each of the preparations were designed to be finished in twenty minutes - more complicated dishes had lots of steps prepared prior to the competition while simpler ones were done completely from scratch. It was odd to watch Matia Lau spend most of her time cutting the papaya into boats with frilly edges while her chef helped with a lot of the preparations when both Jenny Vipusithimakool and Phu Tai Phan's chefs were barred from assisting the contestants. Even though the rules were a bit loose, the competition was fun to watch as camera crews did an effect job of capturing the action. 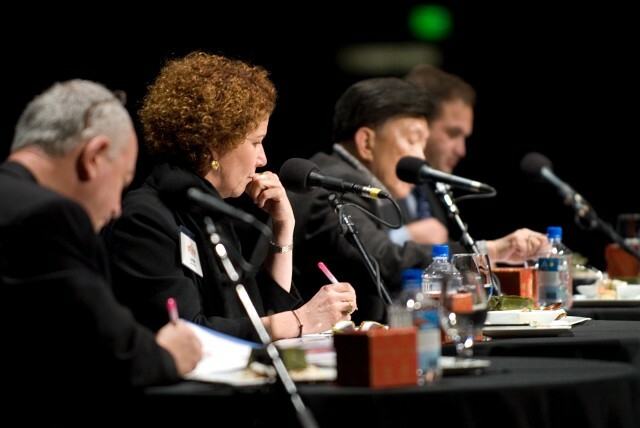 During the whole competition, three hosts (all three spoke English, but two of the others also spoke Mandarin and Cantonese) talked through the whole competition. Tina and I both found the hosts to be annoying and almost seemingly incapable of asking intelligent questions. None of the hosts seemed to have a clue about food or cooking and had a tendency to make comments like "Wow, the onion is chopped so small - you don't see that at our homes" and "Chef, how long did it take to teach her how to cut the tomato?" Perhaps the worst series of questions was when one of the hosts asked a chef who only spoke Chinese a question in mixed English and Chinese and when the chef didn't answer, the host translated into English the question - but did it in such a manner as to claim the chef actually responded in the positive. Because of this, the host ended up claiming that So Ting Chiu said that he and his contestant brought their ingredients inside Chinese take-out boxes because they looked "pretty". One of the more interesting preparations occurred when George Chow tried to prepare his Lobster & Sea Urchin Egg Custard with Ken Tominaga - a sushi chef. George had all sorts of equipment problems when the water for boiling the lobster would not boil (and the pot was way too small), one of the steamers ended up being turned off by Chef Tominaga while it was supposed to be steaming the custards, and the second steamer ran out of water (because the crew forgot to refill the reservoir after the first competition). I spoke to George after the competition and he admitted that attempting a custard in twenty minutes was ambitious, but he had systematically worked out how to get the recipe to work. His family claimed that the recipe was quite amazing and even the judges who tasted a soupy and curdled custard said the sea urchin flavor was very subtle and the flavor of the dish was well executed. In the end, it was the Red & White Roses by Jie Hao that won the category. The award was $5,000 of store credit at Pacific Ranges & Hoods to buy kitchen equipment. Contestant #7: Jamie Tiampo, a full-time student at NYU, prepared Autumn Sky (a dish of seared squab served over chanterelle risotto with a side of pickled fennel and a frisee salad) with Bridget Batson, the executive chef of Hawthorne Lane. Contestant #8: Helen Wu, an oncology pharmacist at UCSF, prepared Autumn's Delight (a marinated dusk breast dish served with a variety of fresh fruits) with Leung Kam Chiu, the executive chef of Koi Palace. Contestant #9: Jeff Gee, a 5th grade school teacher at Cornerstone Academy in San Francisco, prepared Five Spice Brined and Stuffed Pork Chops, with Randy Lewis, the executive chef of Mecca. Contestant #10: Cindy Chan, a recreation therapist, prepared Ahi Tuna Tartare (a layered cylinder of ahi tuna, tobiko, osetra caviar, and creme fraiche), with Scott Howard, the execute chef and owner of Scott Howard Restaurant. Jamie Tiampo won this category with Autumn Sky. Contestant #11: Winnie Phan, a technical manager for Bank of America Help Desk, prepared Triple Hazelnut with Chocolate and Coffee Cream (basically a deconstructed hazelnut tiramisu) with Belinda Leong, the pastry chef of Gary Danko. Contestant #12: Bennie Lau, an IT systems consultant, prepared Pearl of the East (a parfait of green tea and coconut flavored cream and mascarpone cheese topped with lychee and white chocolate shavings) with Bruce Hill, the executive chef of Bix. 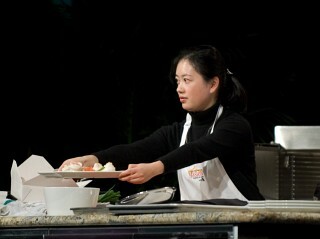 Winnie Phan's deconstructed tiramisu won her the $5,000 of store credit for best dessert. The most amusing remark in the event was made by Judge Ronald Mar during the last tasting of the Asian-Fusion competition: "This is better. The previous two were more confusion... uh, fusion." I had to laugh when I read that "the previous two were more confusion..."